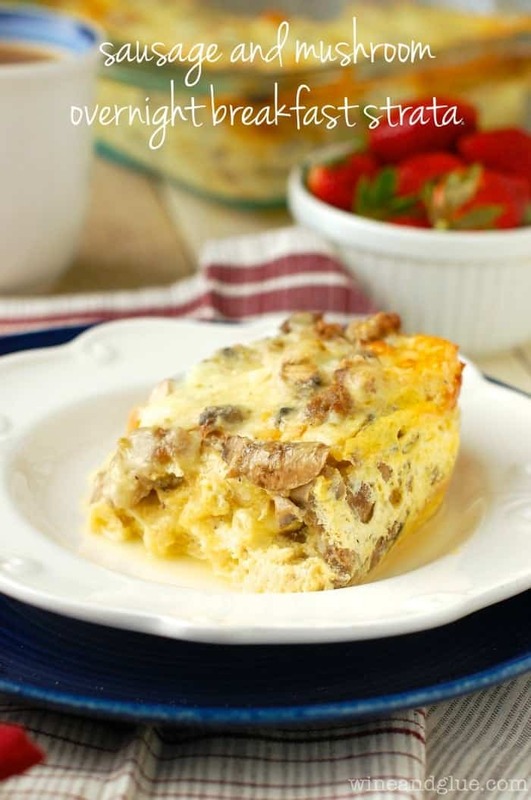 This Sausage and Mushroom Overnight Breakfast Strata is the BEST breakfast casserole! 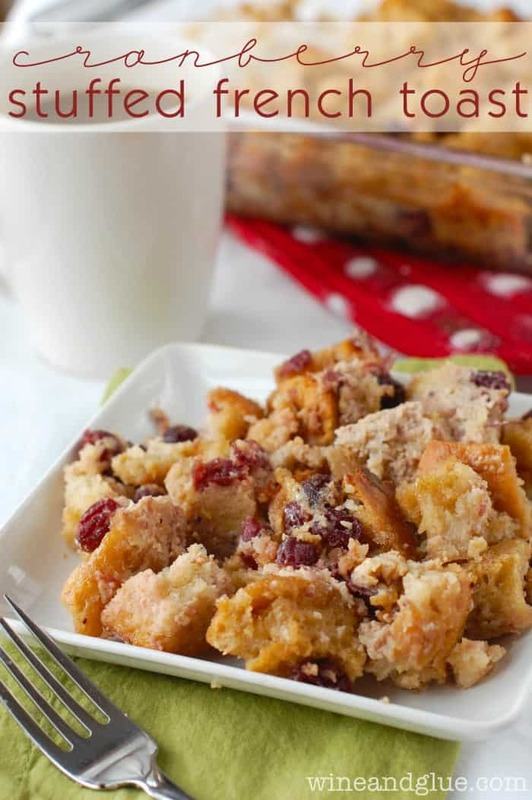 Sure to be a crowd pleaser! I’ve been having this fantasy . . .
See, it’s brunch season, right? I mean with Easter and Mother’s Day around the corner, brunch is for sure on my brain, and on the brain of lots of other bloggers too! So in this fantasy, we are sitting outside of this restaurant (their outdoor seating is this amazing cobblestone bridge, which makes me nervous about my kids throwing crayons in a river, but pretty much it’s just awesome), and I am enjoying my amazing Mother’s Day Brunch and I’m enjoying my even more amazing free Mimosa. Also, in this fantasy, I’m skinny. And my kids are 100% clean and perfectly behaved. Let’s just ignore for a minute that this year Mother’s Day falls exactly a week after my due date . . . . Okay, that’s a little hard to ignore. 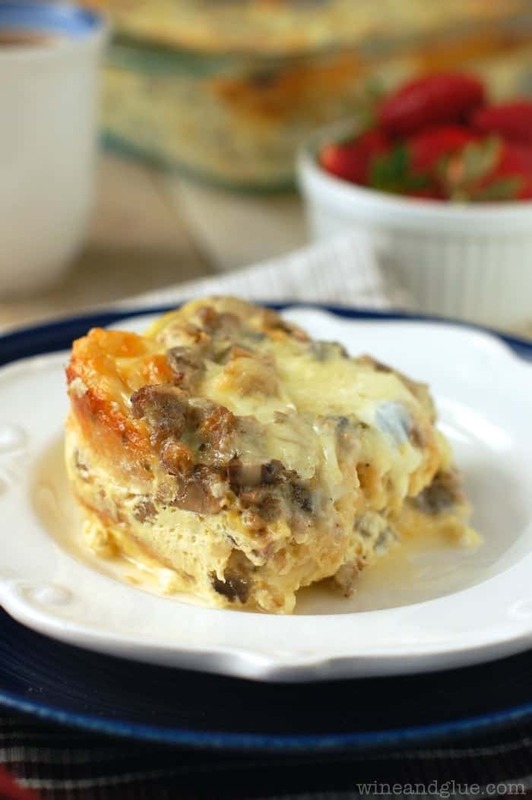 So given my love for brunch (and apparently for grand delusions), it’s a good thing I have this Sausage and Mushroom Overnight Breakfast Strata recipe in my back pocket! 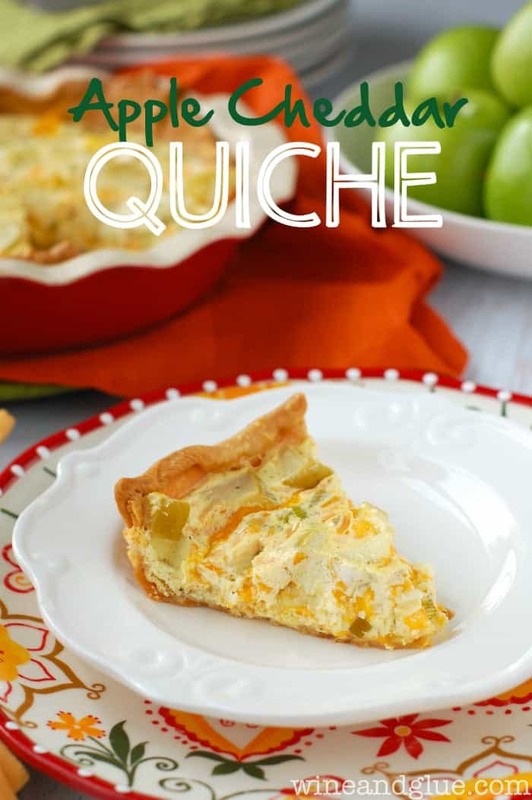 This recipe isn’t hard to make, and it is perfect to put together the night before a family brunch and throw in the oven the day of. It needs to be in the fridge at least one hour, but can stay in there up to 24. Since this is complied of layers, I have step by step pictures of how to put it together. In the last one, you can see that there is a heavy bag of sugar on top of it. You need to weigh it down with something like this before you stick it in the fridge. If I lived near you I’d bring you brunch on Mother’s Day. 🙂 I love this! That would be so awesome, Dorothy, because you would bring me something AMAZING! You better be on time with that baby so you can enjoy your Mimosa!!! 🙂 Love overnight breakfasts. So easy! No kidding Julie!! And a big glass of wine on my birthday! I want that for breakfast tomorrow morning! Wow. This looks so great! 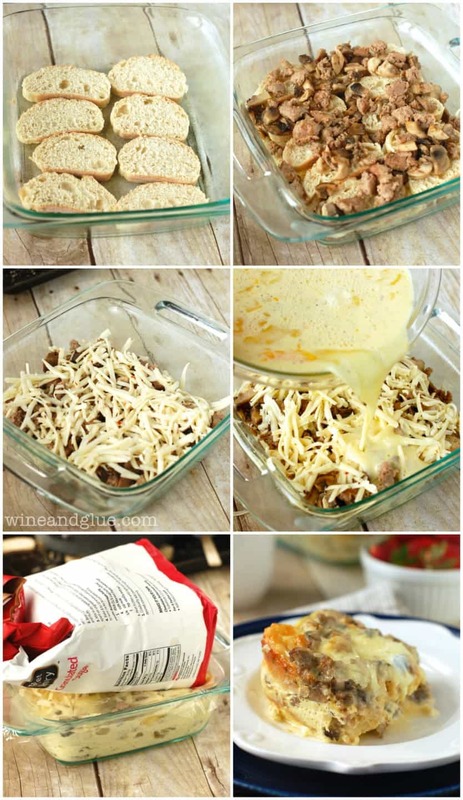 I love trying different versions of breakfast strata..yours looks very tasty (pinned it to try). Have a great week. found you at lbccastpartywed. 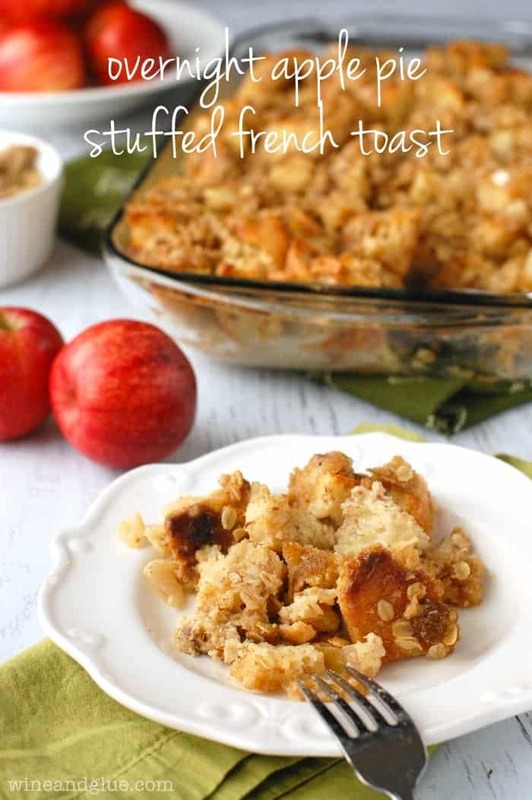 I found this recipe on Pinterest a couple of weeks ago and had it for breakfast this morning. It was WONDERFUL. And very very easy to make. Thanks so much! Hi.. When you say “dry overnight” regarding the french bread, does it mean to leave it out and let it get stale? Yup! Just one night though. You could also stick it in a 250 degree oven for about 15 minutes, rotate the pieces, and then 15 more. I have made strada for years. I combine all the layers just like a an italian dish. I have never weighed it down. I use whatever bread I have on hand without the crust. 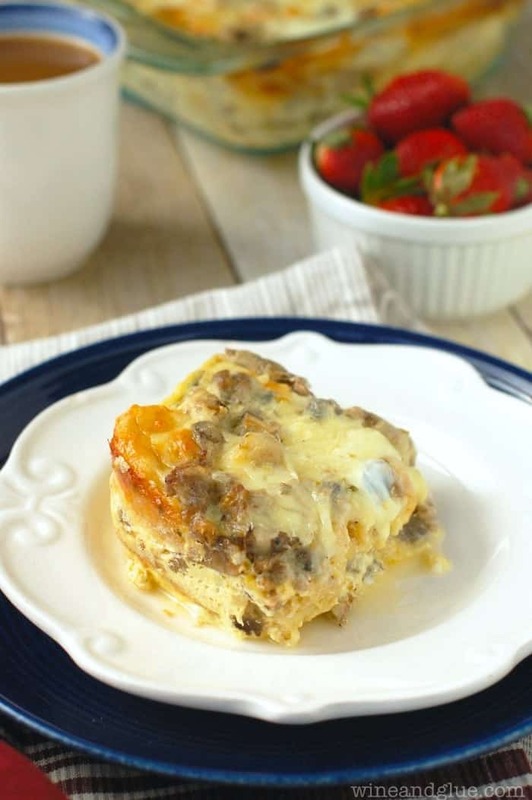 I brown the sausage and in layers I put the bread in a presprayed pan I put the sausage mixture on top I add the milk, egg, salt and pepper on top. I top this with 2 lbs of mozerella cheese, cover it with saran wrap place in the fridge until the next morning. I bake it for 1 hour at 400 degrees and I let it set for 15 minutes before slicing. Serve hot with fresh garlic toast and a cold glass of milk.